The years between 1900 and 1939 represent an extremely turbulent historical moment which saw two world wars, the Great Depression, and the rise of the suffrage movement. Women's fashion is often said to mirror closely the spirit of the times, and this was clearly seen in the rise and fall of hemlines, color palettes and general relaxing of previously constricting clothing. Technology was a huge force of change during this time period, as the Industrial Age kicked into high gear, Henry Ford introduced the Model-T, and the first transatlantic radio broadcast was made. This was a time of transition and progress; although the world was rapidly changing, people were still cognizant of long-held ideals of womanly beauty and clothing trends reflected that. 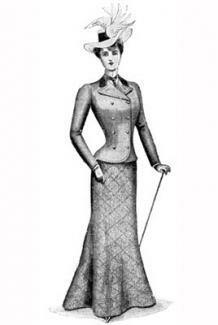 La Belle Époque: Women were still years away from being able to comfortably wear slacks when the year 1910 hit. From the late 1800s to the years before the war started, La Belle Époque style was favored by the rich and privileged. This was defined by sumptuous fashions made in luxurious fabrics. 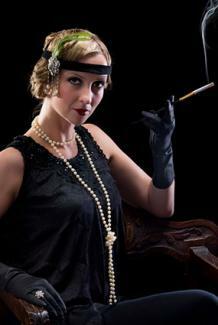 Women who were not part of the upper echelons of society, however, made do with less expensive clothing. 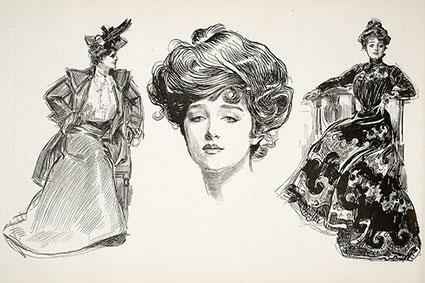 Gibson Girl: This look, viewed as the ideal feminine form, featured a large bosom, tiny waist and rounded backside, all of which were achieved with the help of swan-bill corsets. It fit in with an almost ethereal idea of beauty, where women had long, elegant necks; wore their hair piled invitingly high on their heads and had a faraway, dreamy gaze. World War 1 (then known as the Great World War), which ran from 1914-1919, forced a huge change in clothing silhouettes. The impractical shifted toward practical as women entered the workplace and took part in the suffrage movement. Orientalism: Around 1913, fashion slaves everywhere fell in love with what they deemed Orientalism. Influenced by the vivid colors of the Far East, women's dresses no longer featured the high waistbands of earlier times. Instead, columnar shapes and tube-like dresses were the rule of the day. Because of this new, more fluid silhouette, the tight and binding corsets so often worn by women to create an hourglass shape were abandoned in favor of corsets that were less constrictive, but still contained much of the body in a long straight line. Hobble skirts: As the name suggests, hobble skirts were impractical garments that fit so tightly around the lower part of women's legs that wearers had to hobble to get around. Waistlines were high (empire style), and skirts were wide around the hips, tapering in at the ankle. Fortunately, this hard-to-wear fashion was short-lived, as women clamored for clothing that was easier to wear. Day suits: Long skirts, loose, belted jackets and fur trim often defined day suits (also referred to as walking suits) for women in the latter part of this decade. This style was practical as women took to the workforce while men were fighting during World War I. Often called the Roaring Twenties or the Jazz Age, this was a time of economic revitalization and great wealth as the world recovered after World War 1. Flapper style: Drop-waist dresses, elaborately beaded and fringed embellishments and sparkly headbands were the defining traits of the flapper girl. This was in reaction to the exuberance of the years after the Great War, and hemlines rose to allow for the wild Charleston dancing that so many flapper girls engaged in. Borrowed from the boys: Under the influence of Coco Chanel, simply-cut clothing inspired by sailors rose in prominence during this time period as a reaction against the constrictive clothing of before. Nautical stripes, trousers, and chunky knit sweaters became hallmarks of Chanel's boyish style. 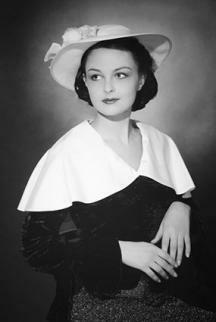 Many women, inspired by Chanel herself, started cropping their hair short and rejecting the corset. This was the fashion equivalent of the emancipation of women. High heels: Heeled shoes became popular during this time period, reaching two to three inches in height (which was quite high for the time). The Great Depression, beginning with the stock market crash in October 1929, had a sobering impact on the fashions of the time. As the world crept towards the World War II, which began in 1939, fashion became less of a concern. Conservative fashion: In the 1930s, hemlines went down and waistlines went back up as the world slowly recovered after the economic crash. Skirts reached the ankles, and waistlines returned to the natural waist. Clothes were also simply cut in order to utilize fabric most efficiently. Focus on the shoulders: Elsa Schiaparelli was a key driver of this trend, credited for "changing the outline of fashion from soft to hard, from vague to definite" (as stated in The Theory of Fashion Design, by Helen Brockman) Day suits came back in fashion, but with an emphasis on shoulders. The LACMA has had historical fashion displays in the museum, including a successful century-spanning one. The Fashion Museum in the U.K. is another great place to delve into historical fashion. They have fashion collections on display, study facilities, and exhibitions, and they also feature some fascinating looks at stars in history and their clothes. The Victoria and Albert Museum, one of the world's top design museums, often features older designs from various centuries. The museum has a specific fashion and jewelry division that includes wedding fashion, designer fashion, and objects in the fashion world. The history of fashion, when placed in context to larger world history, is often an interesting barometer of the considerations of the time. It is interesting to see how style has changed over the years, and to reflect upon the way current events influence the way the modern world dresses. Fashion between 1900 and 1939, in particular, reveals how quickly change happens and how world events impacted fashion trends over this 40 year period.